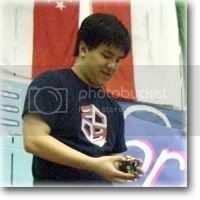 November 21, 2009 : Interview with Speedsolving.com member Timothy Sun : Currently (at the time of this interview) is ranked 15th in the World for 3x3x3 Blindfolded (1:05.97), and 8th in the World for 4x4x4 Blindfolded (9:45.30). Right now I'm living in Manhattan as of August 2009, and before that, Shanghai, China. Full-time (first-year) student at Columbia University. 3x3x3 Blindfolded. I guess I like blindfolded events in general: there's always a huge thrill from the execution phase, but 3x3BLD appeals the most to me because it doesn't take that long to do. I guess I've been interested in solving puzzles in general since forever ago, but speedsolving the Rubik's Cube only came around my freshman year of high school. One of my classmates, Kevin Wang, brought a cube into orchestra class and I spent two months trying to figure out a solution (I got stuck on a two-flip for the longest time). Objectively, my greatest (official) cubing accomplishment would be my 3x3x3 with feet N.American records: my best single is about half that of the next-fastest in the continent. But in terms of what I'm actually proud of, and not something I practiced for easy NaRs, it would probably be my 6/6 multiple blindfolded at the World Championships 2009, namely because I unexpectedly placed in the top 3 and it was by far the best I had done in the event in any competition. Unofficial results... I don't care so much. I play badminton and quizbowl in college and do some recreational programming on the side. I also play cello, but that has slowed down considerably since I left for college. I think 3x3x3 average will go down 1-2 more seconds, but getting faster than that would require something totally new. I also think 2x2 can be done sub-2.5 consistently with a very advanced method like the so-called "SS+CLL" hybrid. I just like seeing world records being broken and having all the events be very competitive (i.e. if Zhuang Haiyan didn't have a total monopoly on 3x3BLD). I'm hoping that cubing doesn't become something incredibly serious to the point that the top cubers undergo strenuous training just to maintain their rankings, etc. World Championships 2009. I got to meet so many people that I had only talked to over IRC, and while the announcer kind of annoyed me throughout the competition, the experience was much better than I had anticipated.